Castor oil in water emulsions, also known as fatliquors are used for lubrication of tanned leather fibres to get softness and improve strength properties. Fatliquoring agents are usually obtained by chemical modification. Now scientists have performed an experiment using nano-TiO2 as emulsifying agent. The fatliquoring agent based on castor oil was prepared using nano-TiO2 as emulsifying agent by mechanical mixing. Thus castor oil/nano-TiO2 composite fatliquoring agent (CTF) was obtained via Pickering emulsion method. Pickering emulsion method is the process of preparing emulsion that is stabilized by solid particles which adsorb onto the interface between the two phases. Results showed that the addition of nano-TiO2 stabilized the emulsion and the application of emulsion in the leather fatliquoring process of goatskin garment improved the physical and mechanical properties of leather. Also, CTF was biodegradable compared to chemically modified castor oil fatliquoring agent. Recent study has found the production of medicated soap from castor oil. Medicated soaps are those used for bathing, and contains additives that helps kill germs and other microorganisms. They can also have other functions like skin toning and age defying effects. Generally all types of soaps are prepared using caustic soda. Now scientists from Nigeria have performed an experiment to produce medicated soap from castor oil extract. Castor oil was extracted via soxhlet extractor and the characterization studies were carried out. It was found that the acid value and saponification value of the oil were between the ranges of values specified by ASTM. The soap produced gave a pH of 8.9 and the antibacterial activity of the soap on the bacterial isolate Staphylococcus aureus showed a greater inhibition zone, thus concluding that a highly effective soap can be produced from castor oil. Researchers from Brazil performed an experiment to evaluate the feasibility of OSB panel production Parica (Schizolobium amazonicum) wood particles bonded by castor oil based polyurethane resin. Three different resin contents (8%, 10% and 12%) were evaluated. Results showed that panels produced with 8% of resin content were best as they were compatible with norm requirements and used less resin in the manufacturing process. Thus Parica wood and castor oil based polyurethane resin in the OSB panels production is feasible. Italian synthetic fibre business Fulgar has launched a new high performance nylon fibre made from biopolymer extracted from castor oil seed. The fibre, Evo, is suitable for all applications, particularly, for the sports sector as it is ultra-light, stretchy and easily breathable. Castor oil and derivatives are widely used in soaps, creams (tretinoin), shampoos, perfumes, lip gels, lipsticks, hair oils, deodorants, lubricants, sunscreens, and other personal care products. 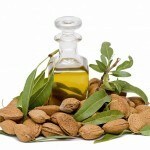 It has been used in skin care products for centuries, and continues to play an important part in soaps and cosmetics. Cosmetics manufacturers use castor oil and its derivatives in formulating non-comedogenic cosmetics (cosmetics that don’t exacerbate or contribute to acne) and emollients. The major companies using castor oil for cosmetics are given in the table. The global demand for organic personal care products is expected to reach $13.2 billion by 2018, growing at a CAGR of 9.6 per cent. Castor today contributes only a small % to this sector, but the potential is much higher. Specialty chemicals market is a $700 billion + market worldwide, with high profit margins. Given castor oil unique versatility, there could be a number of niche applications within specialty chemicals, other than the ones already exploited. More “entrepreneurial” research needs to be undertaken in this direction. While there has been a lot of debate about the use of castor oil for biodiesel, we feel that it is not a viable route. 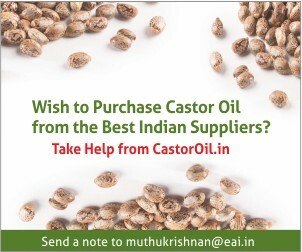 Sure, technically castor oil might be suitable to make biodiesel, except perhaps for its high kinematic viscosity, which could even be taken care of during transesterification. Economics – Price of biodiesel needs to be in the range $900-$1000 per ton; price of castor oil alone is $1300/T. Volumes – World produces about 20 million T of biodiesel every year; world castor oil production is less than 1 million T! In fact, we have been generous on the price aspect. If the current downtrend in crude prices continues, biodiesel might have to sell at less than $700 per T. We dont see how castor oil could support such a price. On volumes, castor is produced in such small quantities, it really is going to make little difference overall to the biodiesel market. And when especially the same castor oil oil could be sold at a much higher price to end users who would be willing to pay a much higher price for the oil or the derivative, we do not see how castor oil biodiesel could work out on any sizable scale. 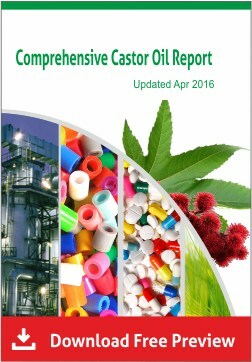 Castor has one of the most diverse set of applications among all plant oils. 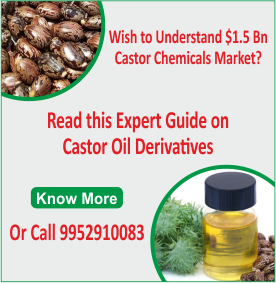 This post reviews and summarises the key current applications of castor oil and derivatives. Another post of mine looks at emerging applications of castor oil derivatives. The current applications of prominent castor oil derivatives. Blown Castor Oil Potential replacement for phthalates, used primarily as a plasticizer for lacquers, inks, adhesives, hydraulic fluids and leathers. 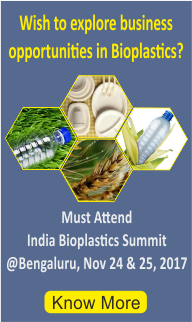 Ricinoleic Acid Uses include, coatings, plastics, inks and cosmetics, Ricinoleate soaps have been patented as algaecides for aquaculture systems. 12-Hydroxy Stearic Acid (12-HSA) Used in grease manufacture, plastics lubrication. Ethanol lubricant – Ethanol has no lubricating characteristics. Castor oil is one of the few lubricants that blend with alcohol. Unique Coating applications – Acetoacetate esters from castor oil are being tried to formulate thermosetting coating compositions. In July 2005, Denmark’s Danisco A/S announced that it has developed a non-phthalate plasticizer based on castor oil. This food-grade plasticizer for flexible PVC has been developed as an alternative to phthalates. Grindsted Soft-N-Safe is made from fully hardened castor oil and acetic acid. The product has been approved by the EU for food-contact applications and is expected to find future uses in toys and medical equipment. Modification of the biopolymer castor oil with free isocyanate groups to be applied as bioadhesive – Surgical adhesives have been used for several applications, including haemostasis, sealing air leakages and tissue adhesion. Despite having anti- bacterial, medicinal and therapeutical values, castor oil can enhance the production of white blood cells and fights infection. It increases T-11 lymphocyte count within hours of application. This initiates body to produce antibodies that fight against viruses, fungi, bacteria and cancer cells. Oral consumption of castor oil is advised for pregnant woman, facilitating uterus contraction, in order to induce labour. The Ricinoleic acid activates EP3 prostanoid receptor in uterus, thus helping in delivery. 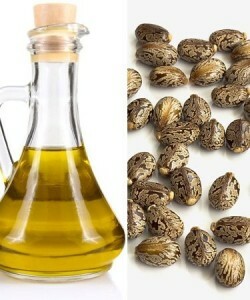 Castor oil is also effective in dissolving the cysts and corns, when applied with baking soda on the infected area. The fatty acid in the castor oil, being easily absorbed by the body, makes it efficient in dissolving ovarian cysts. Castor oil is a laxative and allows proper bowel movement, thus helping digestion and cleansing of digestive system. Ricinoleic acid in castor oil plays a vital role in the cleansing process. Massaging with castor oil followed by placing a hot water bag on the area is an excellent treatment for arthritis. Repeating twice a week produces progressive results. The anti- inflammatory property makes it effective in relieving joint pains, nerve inflammation and sore muscles. 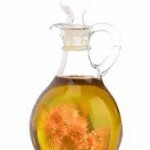 Castor oil Packs increase the blood flow and reduces inflammation. The healing is caused by the influx of so many powerful red blood cells to the area where the pack is applied. Castor oil Packs are beneficial for several issues such as gas, bloating, constipation, diarrhea, gastritis, leaky gut, irritable bowel, etc. Application of castor oil is a process of detoxification; it is effective to apply the Castor oil Packs over the uterus and ovaries, in case of infertility and pelvic pain.